"This is a delicious vodka slush served with lemon-flavored soda. This can be served at parties while the rest are drinking beer!" Bring a large pot of water and sugar to boil. Cool. Stir in daiquiri mix, vodka, orange juice and strawberries. Transfer mixture to a freezer-safe container, and freeze until mixture is to your desired consistency. To serve: Pour into a chilled glass, approximately 2/3 cup of the slush mixture and 1/3 cup of lemon-lime soda. Delicious. 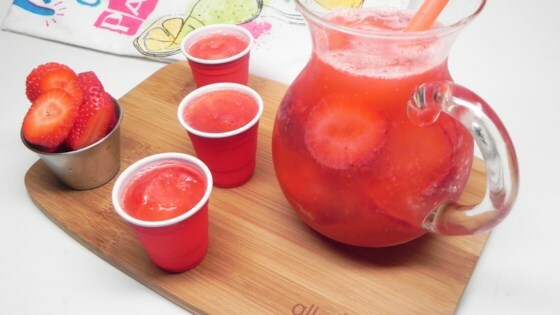 A perfect fruity, boozy, refreshing perfect for the boys and girls of summer! This recipe was alright, just too sweet for me. I like it my easy way; 1 can of Welchs frozen juice (any flavor), 1 can water, 1 can vodka...mmmmmmm vodka juice! We had 2 BBQs over the weekend and my contribution was the hit of each party! I used Strawberry flavored Vodka to make it even strawberrier! I added another cup of vodka. Excellent drink for holiday parties! tried it in limeade and even pineapple soda. FANTASTIC! We did decide we liked it even better after we threw the frozen concoction in the blender, chopping up the strawberries a bit. EXCELLENT!